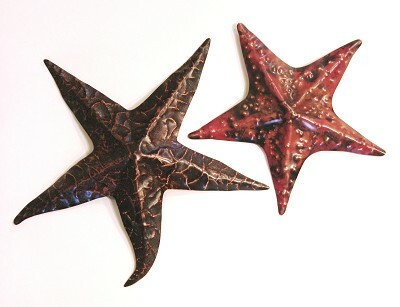 Starfish, copperwork by Marie Jardine. Photo courtesy of the Harvest Gallery, Wolfville, Nova Scotia. Faith has always had a place in our family, even when it has waited at the backdoor…. We lay in the back of our Westfalia camping van. My daugher, Leila, was six years old and had jumped down from the pop-top bunk to snuggle between Mitch and me. I’m sure my eyes were closed. “Mommy, how did God make the world?” She rolled toward me and yawned, pushing her blonde hair out of her eyes. Was Mitch going to say something? Was I? Seven a.m. seemed too early for a godless world. “Did he just… create it?” Leila asked again. “Honey, well…” I began, fumbling toward an unknown destination. In the fog that had enveloped our camper and all of Maine’s Acadia National Park, I saw my whole Catholic life drift by: The dark, dreary church that filled with music and candles at Christmas. The Gregorian chant my dad loved. Our family pilgrimages to St. Anne de Beaupré, to Lourdes in France. The catechism classes I attended to grade nine. Then my teenage investigation and raging disapproval of the Church’s methods of indoctrination. My turns away from a Christ who would cast me off for disobeying his rules, another man to tell me what to do. I often think back to a childhood friend whose parents never brought her to church. She compared her family with mine and thought her parents were lazy, just bad Christians. When we pushed towards twelve and thirteen years old, my friend thought she was going to hell. She continually asked to come to our church youth group meetings, the retreats, and the pro-life rallies my parents made me attend. I’m not sure where my friend’s religious flare ignited, but I wonder if our viewing of The Exorcist had something to do with it—or maybe her Ouija board and our séances. Perhaps she needed an extra layer of protection. I felt bad for my friend; she was confused and scared. She asked me to recite prayers so she could learn them. She scoured my house for icons, crucifixes, and rosaries to borrow. I told her she could have them. She could have them all. That constructed spiritualism was already cramping my teenage style. I told her not to be taken in by the glam, but she wasn’t the scrutinizing type. I didn’t want this to happen to Leila, that she grew plagued by constant fear of the unknown, by a god she neither knew nor understood. She might blame us, her parents, for not teaching her the religious basics. Yes, offering her the gift of openness to all spiritual texts, hand in hand with evolution, seemed the only dignified thing to do. But I was already talking. I tried to make the story compelling and dramatic. She wasn’t buying it. We’d told her over and over our beliefs in evolution, but they just didn’t stick. The universe didn’t stick. Nature didn’t stick. God stuck. “People have their own stories, Leila, and the Bible is the story that Nanny likes best.” I rubbed the sleep from my eyes. I was losing. I pulled the covers up and looked over at my daughter. She stretched her arms towards the roof, the sky, and wiggled her fingers. “So God didn’t invent the world?” she asked. “Stars did? In my late teens, I moved to Montreal for university and began kinships with Muslims, Buddhists and Hindus; I casually left Catholicism behind. My parents knew this exploration would bring me the most peace in life, and they were happy to hear about my travels to meditation centres and to mountains and oceans, places where my heart was home. They had passed along their family values, kindness and equality and structure. They had done what all parents do—their best. Sun peeked through the fog of Bar Harbor forest. Water bubbled over rocks in streams. Momma birds brought baby birds to safety. The universe seemed in perfect balance, and to me, that was enough. As an adult, I’ve come to expect unanswered questions. I light a blue candle in the morning when I begin to write because I read somewhere that blue candles make better writers. I hold the healing powers of rose quartz and yellow citrine in high regard and wear these stones on necklaces and in rings when I need energy. I’ve become familiar with the flexibility of quantum mechanics, a science that bends information depending on stances and light. I accept that; I even like it. But maybe kids need more. Faith. There’s a Baptist gospel church in Florida that my parents now attend when they fly south for the winter. Mitch, Leila and I visit each year and sing and clap our way to the end of a brilliant service. We shake hands with the pastor and thank him for welcoming his northern birds. Afterwards, there are hats and shined shoes and donuts served under tents in the small parking lot. Leila loves it. My parents don’t mind that it’s not a Catholic service. And Mitch and I are, for that moment at least, at peace. Our universe is expanding. Mo Duffy Cobb is a graduate in Creative Nonfiction from the Vermont College of Fine Arts MFA program. She writes about travel, family, and her connection to the great beyond. She has been published in Red, Arts East, and Reconceiving Loss, with stories forthcoming from Damselfly Press and Numero Cinq. Mo is a Maritimer who spent four years in Nova Scotia and is also a graduate in Literature from St. Mary's University, Halifax. Find her on the web at FurtherMo. Marie Jardine graduated from the Nova Scotia College of Art and Design (NSCAD) in 1992 with a Bachelor of Fine Art. For 20 years she worked as a metalsmith and taught at NSCAD and the Nunavut Arctic College. Her work has been featured on television and in magazines and has been exhibited as far away as Denmark. She was published in 50 Years of Canadian Metalsmithing and Three Centuries of Public Art: Historic Halifax Regional Municipality.. In 2008, Marie was diagnosed with copper poisoning so she started working with paper, paint and canvas, making ornaments, jewelry, sculpture, floor cloths and t-shirts. Marie also performs on stage in costumes made from hammered copper, aluminum pull tabs and plastic lids! She plays the Ukulele and is also a student Reflexologist. Marie lives in the town of Kentville in Nova Scotia’s beautiful Annapolis Valley with her dog Shirley. See more of Marie's work at The Virgo Tiger.